Aiden Mitchell – who lives with his Mum and Dad in Witham – took a trip to the nation’s capital this week to help support his favourite charity. The four-year-old was representing Action Medical Research at the annual #GFICharityDay in London. 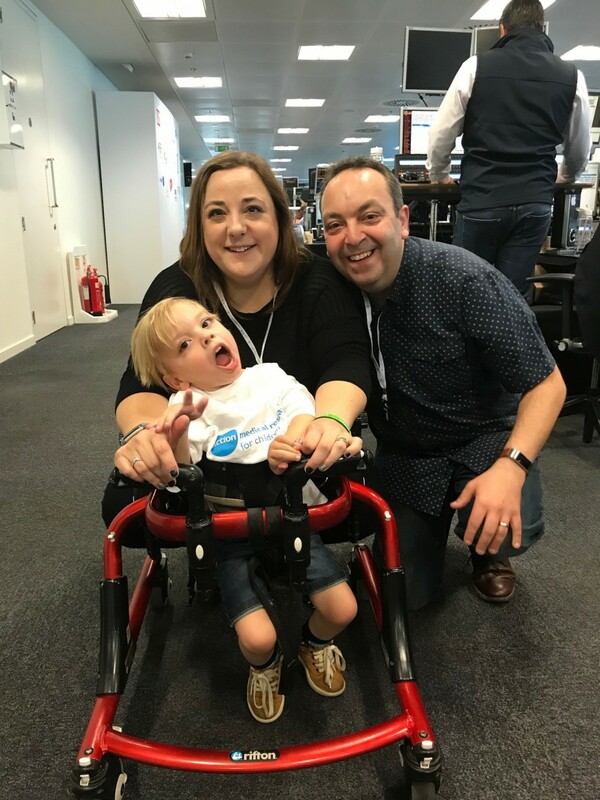 Aiden’s Mum Fleur says he always enjoys the spectacle: “This is our third year supporting Action at this event and there’s always lots going which I think he finds very stimulating. 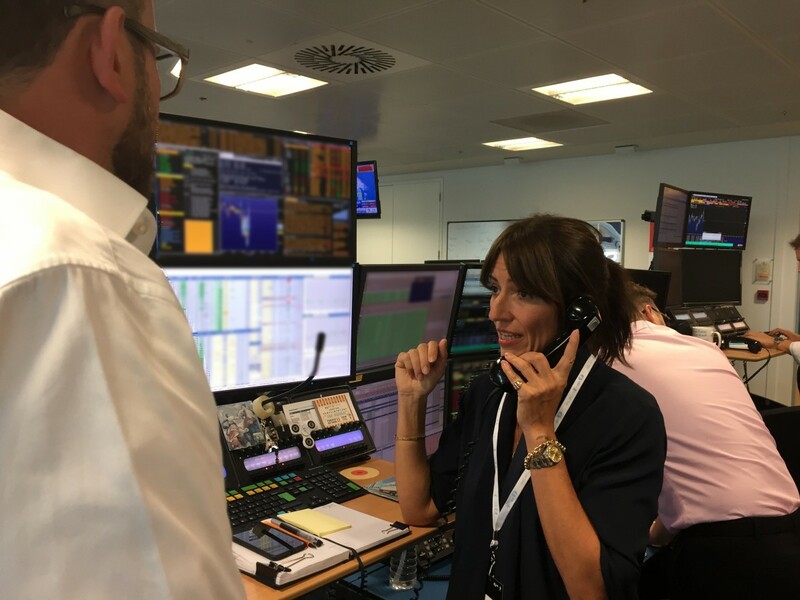 The GFI Charity Day runs alongside the BGC Charity Day with 100% of global revenues raised on 11 September donated to participating charities and the Cantor Fitzgerald Relief Fund. When Aiden was born he suffered from a shortage of oxygen and for the first few hours his parents didn’t know whether he had survived. He was whisked away to the intensive care unit where the team began to reduce his body temperature to protect him from brain damage, a process known as cooling therapy. This breakthrough therapy is the product of a 20-year programme of research to which Action Medical Research contributed. 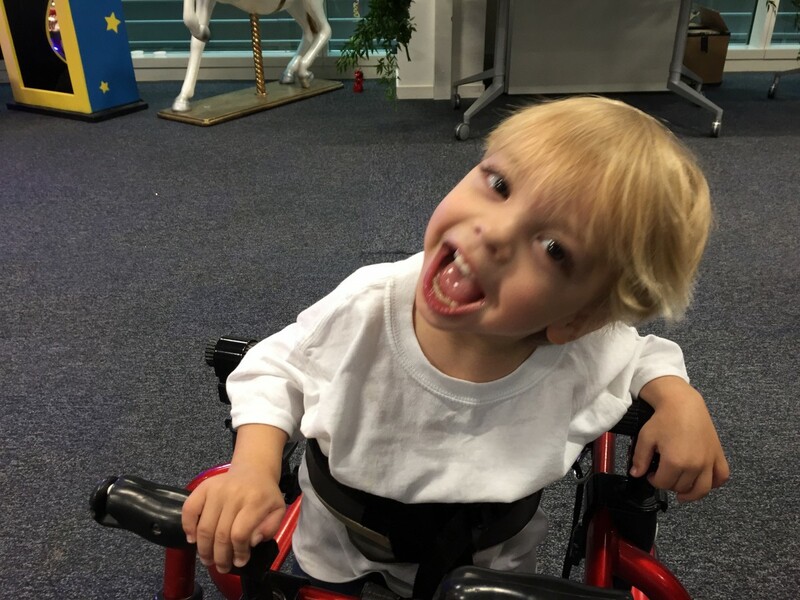 Aiden’s Dad Keith says the family likes to support Action whenever they can: “It’s just such a wonderful charity and we’ll forever be grateful for the research that Action helped fund. 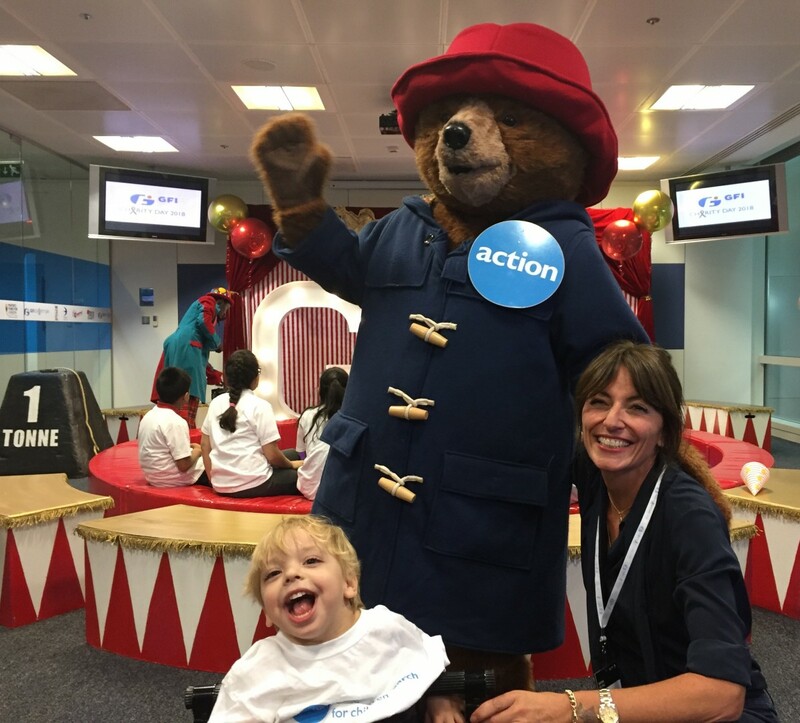 Aiden was joined in London by two other Action supporters: the charity’s mascot Paddington Bear™ and TV presenter Davina McCall. Action Medical Research has been funding medical breakthroughs since it began in 1952 including helping to introduce the first polio vaccines in the UK, developing the use of ultrasound in pregnancy and testing the rubella vaccine. The charity is currently funding research into conditions including asthma, prematurity, epilepsy, meningitis, cerebral palsy, brain cancer and some rare and distressing conditions. For 60 years, British-born writer Michael Bond has delighted children and families all over the world with his stories about Paddington, the bear from Darkest Peru, famous for his love of marmalade. Paddington is popular with children and adults alike who feel affectionate and warm towards him; the charm and humour of the Paddington stories is the key to their enduring popularity. Paddington’s adventures have been adapted several times for television and at the end of 2014 Paddington made his debut onto the big screen. The movie, produced by StudioCanal, part of the international content and media group Vivendi, is the best-selling non-Hollywood family movie ever released. A second Paddington movie, Paddington 2, launched globally at the end of 2017 to great critical acclaim. In 2016, Vivendi took full ownership of the Paddington brand worldwide, with the exception of the classic publishing rights. In 2015, in recognition of Paddington’s extraordinary popularity and success, Michael Bond was made a CBE (Commander of the Most Excellent Order of the British Empire) for services to children’s literature. Michael Bond died in June 2017, leaving behind a legacy of one of the best loved children’s characters in the world. This year marks the 60th Anniversary of the first book, A Bear Called Paddington, which was published by William Collins on 13th October 1958. Licensed on behalf of STUDIOCANAL S.A.S by Copyrights Group. Action Medical Research is a leading UK-wide charity saving and changing children’s lives through medical research. For more than 65 years we’ve helped pioneer ways to prevent disease and develop treatments benefiting millions of people. Our research has helped to beat polio in the UK, develop ultrasound in pregnancy, fight meningitis and prevent stillbirths. But we urgently need to develop more new treatments and cures for sick babies and children and we can’t do it without you.